Peru's sprawling megacapital is actually a mosaic of many smaller cities. 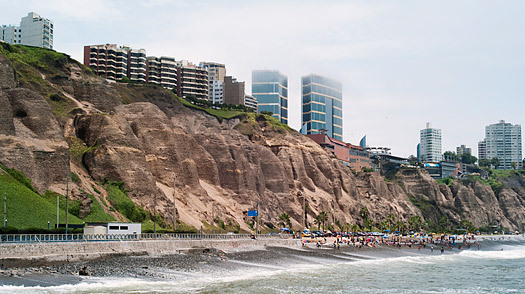 Comprising 43 districts with nearly 9 million inhabitants, Lima is a study in contrasts, with ultramodern seaside neighborhoods butting up against gritty shantytowns that cling to barren hillsides. It is one of the world's few megacapitals that can claim a golf course in the middle of the financial district, and where executives can go surfing before high-powered breakfast meetings. Although it's built in a desert  Cairo is the only other metropolis drier than Lima  it's known as the "Garden City" and is home to one of world's largest fountain parks. While many of Lima's stately manors have given way to glass-enclosed apartment buildings, high-rise business towers and hotels, at least one part of Peruvian culture is returning to its roots here: the cuisine. Lima natives  Limeños  are obsessed with food. A 2009 documentary Cooking up Dreams (De Ollas y Sueños) profiles the emergence of Peru's national cuisine on the world stage. Meanwhile, Lima's government has established a Boulevard of Gastronomy in the Surquillo district, turning a traditional farmers' market into a pedestrian mall to showcase the fresh ingredients used in Peruvian cooking. And the city's annual food festival, held each September, is quite possibly the most important event of the year. The only thing that rivals Limeños' love of food is their passion for pisco, a grape brandy that is the main ingredient in the national drink, the pisco sour. Don't be fooled by its frothy silhouette  it packs a powerful punch.